There is no question about the fact that Shane Perrin is a stand-up guy. My son Jonathan and I had the opportunity to meet Shane this past week on the Texas Water Safari — the world’s toughest boat race. 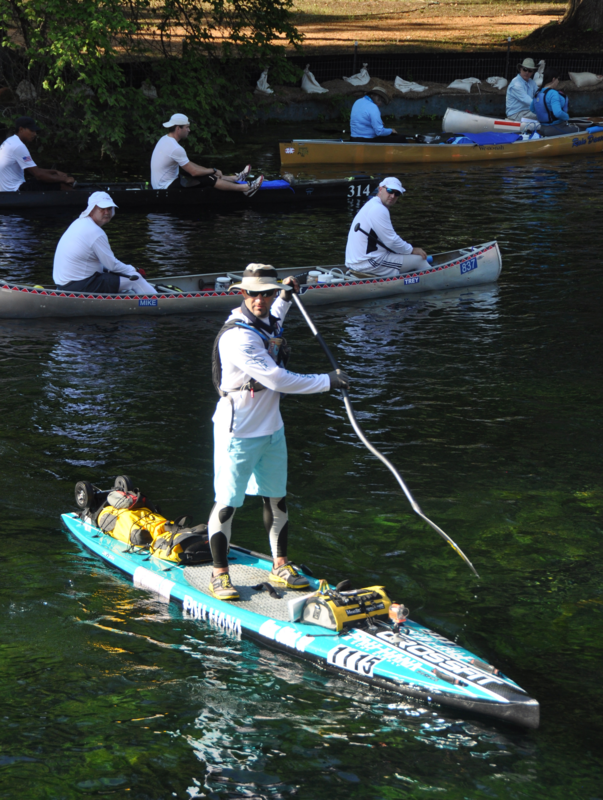 Shane, a 36 year-old St. Louis native, made the journey to San Marcos, Texas to compete in the grueling 260-mile race down the San Marcos and Guadalupe Rivers. The activity at the starting line was hectic as the 130+ competitors stood in line to get their canoes and kayaks on the water and then queue up at their starting positions marked by numbered signs along the banks of the San Marcos River. As Jonathan and I inched our way toward the water, we noticed that the guy immediately in front of us had a custom Pau Hana stand up paddle board — a first in the 50-year history of the Texas Water Safari. In Texas-speak, this was kind of like bringing a knife to a gunfight. Shane definitely stood out at the starting line because he was the only guy standing up. I was personally impressed by the fact that Shane was actually going to attempt to paddle the 260-mile course standing up. However, unbeknown to us, last fall Shane had competed in and completed the MR340 (Missouri River 340), the world’s longest, non-stop river race. He completed the 340-mile course in 67 hours on the 10th anniversary of the kidney transplant that saved his life. Shane then became the first stand-up paddler to compete in the 179-mile La Ruta Maya Belize River Challenge. So, when Shane showed up with his paddle board at the Texas Water Safari, he came more than prepared to go the distance. It wasn’t long before he became the talk of the race. At checkpoints along the way folks would ask about the stand-up paddler and then cheer for him as he arrived at and departed each checkpoint. Shane had unwittingly captured the admiration of lots of folks along the way. We all became his fans and found ourselves rooting for him. Shane’s story spread so quickly that the Victoria Advocate newspaper wrote an article about him before he ever finished the race. Pretty cool! Jonathan and I paddled alongside Shane at several points along the way. We were more than impressed by his progress. Sometime around the 200-mile mark, we saw Shane nursing a swollen left ankle. He told us that he could no longer wear his shoe on that foot. But, even a swollen ankle did not deter Shane from what he had come here to do. 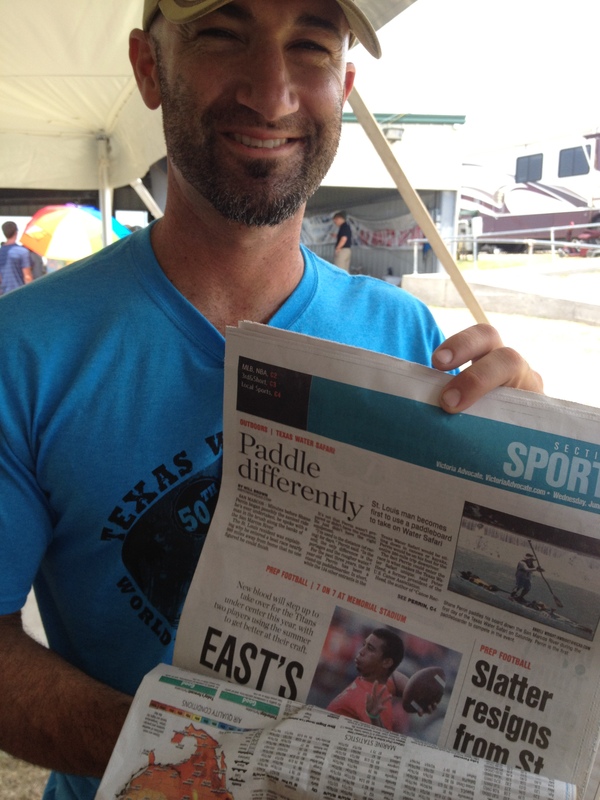 He paddled on in spite of the pain and made it to the finish line — making Texas Water Safari history. I have lots of respect for guys like Shane who are not afraid to go against the grain and who show us new ways to do things. Jonathan and I enjoyed spending time with Shane at the awards ceremony. You only need to spend a few minutes with him to feel his passion for paddle boarding. He’s a really nice guy who discovered his passion for adventure and who is not content to just sit and watch life flow by. He wants to get in the current of things and, by so doing, inspire others to think a little more deeply about doing the same. You can learn more about Shane and stand up paddle boarding by visiting his website. Was great to paddle with you (Omar) and your son Jonathan. You are 2 great guys that were always happy and fun to talk to during the race. I had blast out there. Thanks for the article. Nicely done. Thanks, Shane. You are an inspiration to us. We too enjoyed the opportunity to get to spend time on the river with you. Hope we have an opportunity to paddle again with you in the future. Godspeed on all of your upcoming paddling adventures.